The interaction spotlighted the military collaboration between the two sides despite lingering challenges. From March 10 to March 13, Philippine Defense Secretary Delfin Lorenzana paid a visit to Vietnam for a ministerial meeting. His visit spotlighted the ongoing efforts by both sides to continue to develop the defense aspect of their relationship despite lingering challenges they face bilaterally as well as in their wider domestic and foreign policies. As I have noted before in these pages, while Vietnam-Philippine diplomatic ties stretch back far longer, the relationship had been given a boost including in the defense realm during the years of President Benigno Aquino III, with a memorandum of understanding on defense cooperation reached in 2010 and ties upgraded to the level of a comprehensive partnership in 2015. 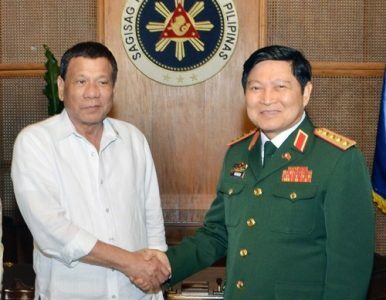 Despite the challenges posed by the emergence of Philippine President Rodrigo Duterte, which has undercut the extent of convergence between Hanoi and Manila on issues such as China’s growing assertiveness in the South China Sea, the two countries have continued to try to make progress on some aspects of ties, at times in a much quieter fashion than had been the case in the past. Some initial engagements that had not taken place during the outset of Duterte’s tenure have also since been resumed. That has continued on into 2019 as well. Indeed, in early March, the two sides held another iteration of their Joint Commission for Bilateral Cooperation – thee first under the Duterte administration – where the two foreign ministries formally inked the next Philippines-Vietnam Five Year Plan of Action out to 2024. Earlier this month, the defense component of the relationship was in the headlines with a trip made by Philippine Defense Secretary Delfin Lorenzana to Vietnam. Lorenzana paid a scheduled official visit to Vietnam from March 10 to March 13, in an engagement that came just days after the JCBC meeting had been concluded. Lorenzana’s trip consisted of a series of interactions. In terms of meetings, he and his delegation met with several officials including Defense Minister Ngo Xuan Lich, who is also the deputy secretary of the Central Military Commission and a member of the Politburo of the Vietnamese Communist Party (VCP). As is usually the case, the meeting between the two ministers touched on various topics, including reviewing the state of bilateral defense cooperation to date, and discussing regional and international issues of mutual concern. Per Vietnam’s military, the two ministers agreed to boost bilateral defense relations with a focus on areas such as enhancing exchanges and consultations, defense industry, non-traditional security, cooperation between the two air forces, and military medicine. The Philippines also reiterated that it would support Vietnam in defense-related engagements as it takes over the annually rotating ASEAN chair in 2020. Apart from these meetings, Lorenzana’s official visit consisted of a series of other engagements as well. These included visiting Viettel, a military industry telecom group, laying wreaths at the Monument of Heroes and Martyrs in Hanoi, and visiting the late President Ho Chi Minh at his mausoleum. What’s Next for Vietnam-Philippines Defense Ties?